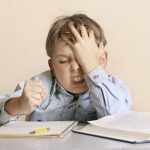 This is an excellent list because eight years ago while I was applying to PA school I proved how adhering to each one of these elements was a guaranteed formula for failure. 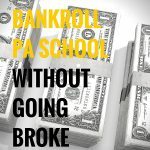 I wrote a blog post a while back about how to get into the PA school of your choice. Part of my recommendation was to throw caution to the wind and apply with your heart and not your mind. This as you know, is easier said than done. Every one of the above pitfalls is what happens when you think too much. I applied to five PA schools in 2001 (prior to The Central Application Service for Physician Assistants (CASPA). First, I used an essay that I thought gave the review committee everything they would need to see that I was a stellar applicant. It showed my strengths, brown nosed a bit, and proved that I had the pedigree to be a wonderful healthcare provider. But, as you will see, it lacked heart, honesty, passion and most of all . . . grit. I received my fourth rejection letter as I was completing my application for the University of Medicine and Dentistry (UMDNJ). I was demoralized. That night I sat down at my computer and composed what would become the 600 words that changed my life forever. I had not read them for over 11 years until this morning. I had never taken the time to go back and see what made the difference. What had made the essay I sent to UMDNJ different from the previous four flops? 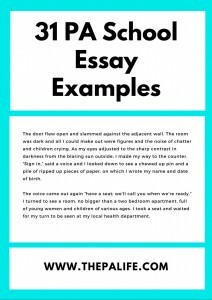 I was thinking about this list of essay pitfalls this morning and decided to go back and see if I could find my original essays. I was delighted to find all of them, they brought back strong feelings and wonderful memories. 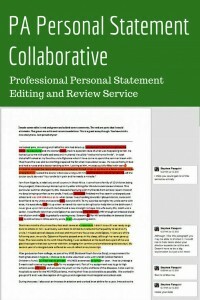 I am going to share with you both essays. The one that worked, the one that didn't, and I want you to guess the winner. Avoid the urge to reveal the answer, reading through both essays will help you as you sit down to write your personal statement. When I applied to UMDNJ (Rutgers) I was 0.1 points below the minimum GPA requirement to even consider sending an application. The fact that they opened my application, and offered me an interview was a miracle. Yet, I was admitted just a week after my trip to New Jersey. Where were those other 4.0 Ivy leaguers I met during my interview? They were placed on the waiting list. I am not trying to gloat, but I want to point out that the essay may be the single most important thing you do. 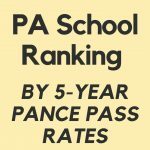 I believe it is the reason I was accepted to PA school. 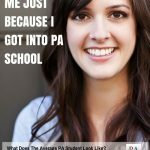 Two PA School Applications Essays: Why Do You Want To Be a PA-C? Every day is a gift to be embraced wholeheartedly. It is our job to fill that day with a hopeful and meaningful purpose. It has been said that “the most important thing in life is to live your life for something more important than your life” William James. 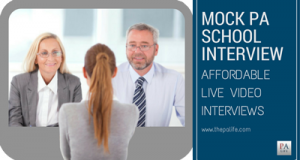 It is deeply rooted in this philosophy that I desire to become a physician assistant (PA). I hope to provide quality healthcare to the underprivileged, an area of medicine, which I have noted to be dramatically underserved. I became involved in health care four years ago to help finance my college education. I worked as a medical record’s clerk in the University of Washington health clinic. In addition to delivering medical records, I assisted the hospital staff in a variety of activities. I loved working with the staff and admired how well they operated as a team. I desired more direct patient care and in January 1998, when a student position opened in the lab, I jumped at the opportunity. In a few weeks, I was drawing blood, interacting with patients, and helping with a variety of technical procedures. I loved what I was doing. The patients were often uneasy when facing a needle for the first time. I was able to comfort them, help them to smile, and ease their nervous tensions. My job required that I work throughout the various University hospitals. This provided an opportunity to work within a variety of settings, and with people of all ages. Whether it was doing morning rounds in labor and delivery or working in the campus health clinic, one thing always remained the same; I found great satisfaction in caring for patients and learning of their needs. I felt a career in medicine was truly for me. 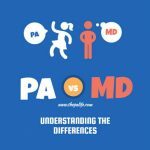 While working at the clinic I discovered the PA profession. I have always enjoyed the complexities of science and have been fascinated by a career in medicine. In pursuit of this goal, I decided to speak with one of the resident doctors in the clinic. She introduced me to the role of Physician Assistant. After that, I immersed myself in research. I was surprised to learn that many people with whom I worked were Physician Assistants. I met with hospital staff, nurse practitioners, Physician Assistants, and physical therapists. I regularly visited the PA at the clinic and admired his significant level of patient interaction and his ability to work both autonomously and alongside other physicians and nurses. I admired the PA program’s flexibility and versatility, which would allow a change of specialties if I desired. I began to focus my attention on becoming a PA. 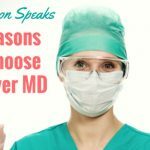 Being an independent thinker, as well as a people oriented individual; I feel that I am well suited, not just for a career in the medical field, but for a lifetime career as a Physician Assistant. As a child, every day, I would swing on the swing set in the backyard of my house. I would sit there for hours, without a care in the world simply singing songs and swinging back and forth. On that swing, I felt untouchable. Like a bird in flight, my only cares were that of the sky and the beauty of each adjoining minute. In the swings gentle motion I was overcome with a sense of peace. We wake one day and find that the swing no longer exists. Our backyard has been rebuilt and the ground, which had once supported our youth, has been transcended. We search again for the swing, longing to find a resemblance of that peace. We hope to find it each day, as the product of our life and of our career. A woman smiled at me one day, her name was Margaret. The wrinkles on her face told a story and in her hands there played a motion picture. She sat crouched in a wheelchair; I sat on a stool beside her. I had been working as a phlebotomist in the University Clinic for two years. I was a friend of Margaret’s because every Wednesday at six she would arrive at the clinic for her routine blood work. Everybody liked Margaret; she used to tell us stories of her childhood and her husband who had given his life to the war. She had grown especially fond of me because “I had freckles like her grandson.” She used to come alone, but had grown weaker; this was the first time her daughter had accompanied her. Her daughter looked tired and spoke softly, “The best vein is in her hand” she explained, “it doesn’t hurt her there.” I gently placed my hand on hers, and it was cold. She looked to me and through the cold touch of her hand poured the warmth of her heart. “It’s about time for dinner don’t you think mom”, said her daughter. The clock rang six and I agreed. “The medicines have been making her sick; she sometimes has troubles keeping her food down.” I looked closely at her face; it was thin and drooped to her chest. I realized that Margaret was unable to speak. “Margaret, can you make a fist for me?” “Just like last time.” She clenched tightly. I withdrew the needle and collected a small sample of blood. She raised her head and with her frail hand, gently placed it on mine. I looked again to her eyes while placing a bandage on her hand. It was warm now. “Time for dinner mom”, replied her daughter. I smiled and waved goodbye “Margaret I will see you again next week.” She raised her head and smiled. Without a word, she made perfect sense. I never saw Margaret again. In the memory of Margaret and every patient who has individually touched my every day, I have regained a piece of the backyard swing that I loved so much as a child. I have been directly involved in health care for four years. Every day has brought great joy. To be a part of a person’s day is a wonderful blessing. Certainly, there are many pleasures in life. But, for me, none is greater than that which we find in the healing touch of another. As the eternal motion of the swing, it is in this that I find great peace. Which essay is the one that got me an acceptance letter? The difference: One is written from the heart, the other is full of clichés, lacks specificity, has no theme, has a boring introduction and a weak conclusion! As you sit down to write your PA school application essay remember this example. In life, almost nothing ever goes to those who try to blend into the crowd. Your PA School application essay should be different, reflect who you really are and not pander to what you think other people want to hear. This is a rule of thumb not just for your essay and for applying to PA school but for life in general. As you write dig deep, don't hold back, believe in your words. Set your mind aside and try to find that place inside your head where your heart resides. This is where you will separate yourself from the crowd, this is where your journey to PA both begins and ends! 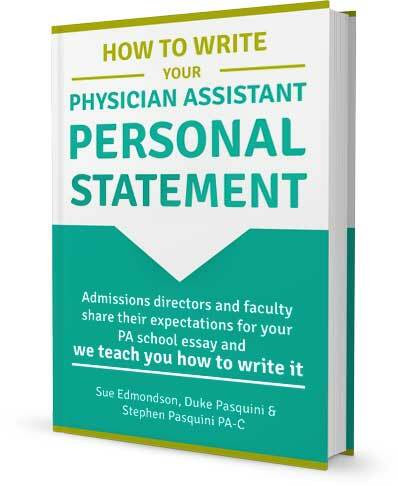 Are you struggling to write your physician assistant personal statement? Are you dreading a second, third or fourth application cycle? I recently finished my first draft and would love some input! Passion. It is the simple, seven letter word that sums up a person’s goals, aspirations, who they are, and who they strive to be. I believe one’s life should revolve around what they are passionate about and those passions should drive them to happiness and success. As I walked into work that hot summer day, dental hygienist Stephanie explained to me why she regrets not following her dream of becoming a dentist. She told me, “dentistry is my passion.” I could see it in her eyes as she explained to me how much it means to her to be able to help her patients that she truly loves dentistry. Having wanted to be a dentist for the past 3 years of my life, it was a tough pill to swallow when I realized dentistry didn’t give me the same glow in my eyes as it did hers. I yearned to discover the career that would make my eyes light up the same way Stephanie’s lit up when she talked about dentistry. From the time I was a young girl I always had a smile on my face, was eager to learn, loved working as a team and running for leadership positions, and simply loved life. Whether I was working on my duties as student council and class president, participating in athletics, or volunteering at local blood drives, I’ve always had a drive to not only better myself, but share a smile everywhere I go in hopes of making even just one person’s day a little better. To this day, one of the most gratifying compliments I have ever received is that I have a smile that can light up a room and a personality that can’t be stopped. As I made my way through high school, I quickly realized how much I love working with people and was drawn to the medical field, but I wasn’t able to pinpoint a career field that exactly aligned with my interests and the lifestyle I wanted to live as an adult. In all honesty, I didn’t think I would ever come across a career that would peak all my interests and draw me in for the rest of my life. As the days of summer winded down, it was time to head off to UMKC’s Biology Bootcamp to kick off freshman year of college. While there, Kathy Ervie spoke about the PA profession, what a PA is, what they do, and laid it all out on the table. 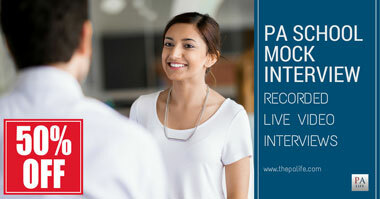 Considering I had never even heard about the PA profession, I had a lot to think about if I wanted to pursue a career as a PA. From then on I began doing my research, and it was not long before I was hooked on the profession, but knew I had to get in and shadow to confirm the PA profession would be right for me. This led me to PA Andrew Rendoff, who I had the privilege of shadowing for 50 hours over the course of two months. Through him, I learned the ins and outs of being a PA. 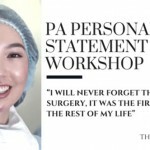 In that short time I was captivated by the relationships he had with his patients and the physician, the role he played in the clinic and during surgery, the rush I got when I was able to experience surgery first hand in the operating room, and the autonomy a PA has while still working as a key member of a team. By the end of my freshman year of college, I was determined to start doing whatever it took to explore the medical field and get as much experience as possible, which led me to KC Phlebotomy where I took a course to become a certified phlebotomist. I was then connected with Doctors Paul Reicherter and Jessica Jellison and began working at Jellison Integrative MD as a medical office assistant (a title we totally made up not knowing what would be a good title for my role). My duties not only include completing office work and taking phone calls, but also working with patients and the doctors to give our patients the best care possible. On a daily basis, I am giving patients infusions, drawing blood for lab tests, performing a variety of tests on patients, and getting them checked in and out. It is at Jellison Integrative MD where I fell in love with patient care. I fell in love with the patient interaction, getting to work as part of a team, and seeing patients get better with each visit. I love seeing patient’s medical symptoms questionnaire results go from the hundreds down to single digits and being able to show when how far they have come. I am proud to be able to say I have finally found the glimmer in my eyes that I have been looking for for so long, and from here on out, I am dedicated to doing whatever it takes to turn my passions into a lifestyle. 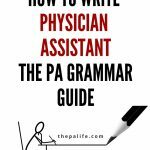 I want to be the best, most competent physician assistant I can be and help advance the PA profession in every way possible. With my experiences working at Jellison Integrative MD hands-on with patients as a part of a medical team, volunteering with Community Blood Center, and as a member and officer of UMKCs Pre-PA society, I have a lot to offer UMKC’s Physician Assistant program in helping achieve the program’s goals and living up to the mission statement by going into the PA profession with the ambition to achieve clinical excellence, the desire to serve, and dedication to the profession. I am just finishing revising my personal statement for PA school. I made somem changes after reading yours and seeing what a difference it made. Would you be willing to read my draft? The sun was beating down on a hot afternoon in the middle of the sugarcane field where a small concrete structure was standing without any A/C, fans or electricity. A line stretched out the door with more people trying to come inside. For one week, I was able to help out at a free medical clinic in the Dominican Republic. Throughout the week, I was able to help people by transporting them from triage rooms, giving them anti-parasite tablets as well as assisting and shadowing the physicians treating the patients. Seeing over 300 people in the clinic and treating conditions ranging from hypertension to meningitis was an incredibly fulfilling experience. I loved being able to see so many patients in such little time with a large diversity of cases. As all of the volunteers packed up and left the Dominican Republic, we rewarded ourselves with a nice dinner out. Due to this, all but three members of the group contracted parasites and we had to take the same anti-parasite pills that we had previously given the clinic patients. Even with this unfortunate circumstance, I realized that the reward of being able to care for others was absolutely worth the risk of possibly getting sick myself. I came back to Illinois and decided to take a class while still in high school to become a certified nursing assistant. At 17, I was able to obtain my licensure and at 18 I landed my first professional job in the medical field as a CNA in an assisted living facility. While in this facility, I was placed in the Hospice, Alzheimer’s and Dementia wing where I met many wonderful people. By the time I resigned from this position 2.5 years later, all but 1 of the patients that I began with had unfortunately passed away. I became so close to some of the patients and their families that I went to many of their funerals and grieved alongside their loved ones. This job taught me about the cycle of life and the reality of death that I would have to face if I wanted to continue in the medical field. While in college, I learned about a great new opportunity that would give me a new experience with physicians in a completely new setting. After meeting with a representative that visited my college, I became a scribe in the emergency room at Ingalls Memorial Hospital in Harvey, Illinois. This is where I got to experience a fast paced environment where anything and everything could happen. I learned how different physicians faced each complicated issue and how they could utilize the resources of the hospital and others around them to help their patients. I also learned about the role of a physician assistant, and how they interacted with the physicians and medical staff within the emergency room. Once I transferred hospitals and was promoted to the role of chief scribe at Rush University Medical Center, I was tasked with the need to know who each employee was and what their job entailed. Each time I would train a new scribe coming in, I would need to introduce them to the other employees and inform them about the different roles they play in the emergency room. Due to this, I became very close with several physician assistants who were my constant supporters. 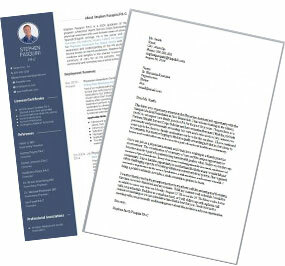 I noticed that the physician assistants were extremely personable and had a love for their job without much burden. 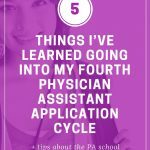 I frequently asked the PAs questions about their job and how I could begin a career as a PA, since I always wanted to work in the medical field, but did not know which position I was most interested in. Every time I learned more about the physician assistants that I worked with, I felt as though it would be the perfect career for me. After 16 years of schooling, it only took me 2 years working with PAs to figure out the many benefits and opportunities that a career in the field would provide me and my family. My love for medicine, my dedication, and my hard work are all excellent foundations to a career as a PA. Working in several different facilities, in different roles, and with a variety of diverse patients helped me to realize what an impact I could have on my patients and the field of medicine as a Physician Assistant. I appreciate the fact that you posted this. The first and second drafts of my personal statement was very similar to yours in terms of structure and content. 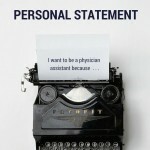 I read the PA School Essay #2 and made quite a few changes to my personal statement as a result. Would you be willing to read my revised draft? Hi Madison, would you mind posting it here so I can give you a critique in the comments section? During my sophomore year of college, my grandmother was diagnosed with ovarian cancer. Despite what seemed to be an impending doom, my grandmother, who had already endured excruciating chemotherapy treatments years earlier secondary to colon cancer, emitted optimism as she laid in the hospital bed. Her eyes glistened as she recounted stories of my grandfather who had passed away years before I had been born, her smile radiating as if it were yesterday. As the weeks progressed, the oncologist informed my family and I that the cancer metastasized to her liver. In a matter of days, my grandmother’s stories were replaced with silence as she lay, her once glistening eyes flooding with tears as the nurse collected routine blood samples. She contracted nosocomial pneumonia at the end of her battle and I remember my last moment with her; the only audible noise was the whistling from the ventilator. I grasped her cold hands, staring at them the same way I did as a child. When I was younger, I always wondered why her fingers looked as though they were pushed toward the little finger, not realizing that she had ulnar deviation secondary to rheumatoid arthritis. I would push my fingers in the same direction so that my hand could resemble hers. In that moment, I understood that it would be the last time I would ever hold my grandmother’s hand. I understood that, in the recesses of my soul, there would be an absence. The woman smiled as she handed me her clipboard at the front desk; the Shepherd’s Hope patient registration form revealed that her name was Maria. She walked back to her seat in the waiting room, trying to calm her children as she waited for a consultation with the clinic’s eligibility specialist. She looked tired, but was patient, simply holding a finger to her lips as the children restlessly waited with her. I may have lost my grandmother to cancer, but I feel her spirit through my involvement in healthcare. Whether it is through the warmth of a hand gently resting upon my own, or through a simple “It was a pleasure speaking with you, too,” the absence that manifested in my soul fills with the gratitude from the patients whom I interact with. I began this “new version” a few days ago, so I know that I still have to iron out the edges—particularly the transitions and the final paragraph. 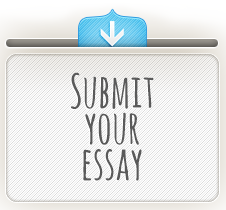 The most important that I would like to ask you, though, is this: do you feel that this essay answers the prompt? 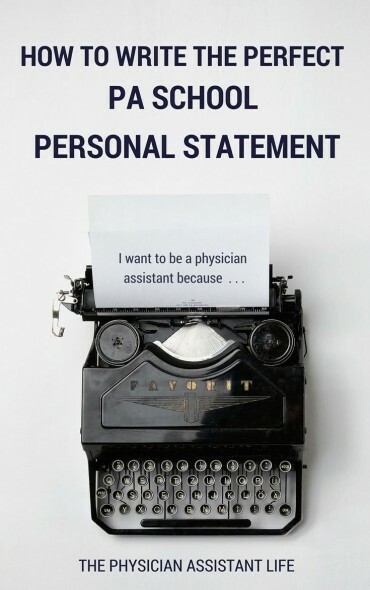 I recognize that I do not even address the words “physician assistant” in this draft of my personal statement. This draft also lacks any mention of the experiences that I have had shadowing or working as a medical scribe. Nonetheless, I feel that, through expanding on my volunteering experience, this version has more heart in comparison to the my other draft. My other draft is very similar to your PA School Essay # 1; it basically outlines everything that has led me to want to pursue a career as a PA.
Stephen, I apologize as my previous post is a variation of this draft that I am not as confident with. Please read this draft instead. During my sophomore year of college, my grandmother was diagnosed with ovarian cancer. Despite what seemed to be an impending doom, my grandmother, who had already endured excruciating chemotherapy treatments years earlier secondary to colon cancer, emitted optimism. Her eyes glistened as she recounted stories of my late grandfather, her smile radiating as if it were yesterday. As the weeks progressed, the cancer metastasized to her liver and my grandmother’s stories were replaced with silence. She contracted nosocomial pneumonia at the end of her battle and I recall my last moment with her; the only audible noise was the whistling from the ventilator. I grasped her cold hands, staring at them the same way I did as a child. I was always fascinated by the orientation of her fingers, wondering how they were able to stay pointed toward her little finger, not realizing that she had ulnar deviation—a consequence of rheumatoid arthritis. During this time of grief, I remembered a statement made by my former karate instructor Sensei Mike. “Each time you step into this dojo, you are dedicating your time to something greater than your individual self. You become a part of a team, a family.” His words reminded me that my grandmother would not want me to wallow in despair, but rather devote myself to something that could better the lives of others. The woman smiled as she handed me her clipboard at the front desk; the Shepherd’s Hope patient registration form revealed that her name was Maria. She walked back to her seat in the waiting room. She looked tired, but was patient, simply holding a finger to her lips as her children restlessly waited with her. I may have lost my grandmother to cancer, but I feel her spirit through my involvement in healthcare. Whether it is through the warmth of a hand gently resting upon my own, or through a simple “It was a pleasure speaking with you, too,” the absence that manifested in my soul fills with the gratitude from the patients whom I interact with. And that could be enough—volunteering at a health center for uninsured, low-income patients—but I would like to extend my hand further. I would like to see each patient not just as they enter and exit through the clinic door, but throughout their entire healthcare journey. My experience as a medical scribe in the Florida Hospital Lake Mary emergency department has elucidated that the perfect marriage of patient-provider interaction and clinical medicine can be achieved through the PA profession. Kerfala Fofana, PA-C was one of the first providers whom I worked with as a newly hired scribe and exemplified this balance of sciences and personal interaction. Kerf’s exuberance was contagious; upon entering each patient’s room, Kerf would greet the patient as if he were greeting a long-lost family member. 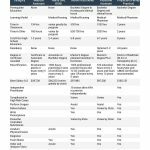 He openly consulted the attending physician, whether it was with regards to recommendations on an antibiotic or on admitting a patient to the ICU. Unfortunately, Kerf’s mother became ill, so Kerf traveled to his home in Africa to monitor her and has not returned to the Lake Mary emergency room since. While I lament the lack of time I spent with Kerf, I appreciate his dedication to his patients, notably one of his newest—his mother. Kerf has shown me that sentiment cannot be sacrificed, not matter how full the waiting room becomes.